Dr. Aldo Arrastia Ilarde started his medical journey at the University of the Philippines College of Medicine in Manila, Philippines. 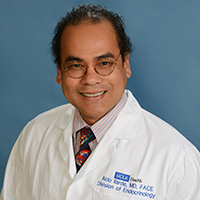 He then pursued his Internal Medicine training at Lutheran Medical Center (now NYU Langone) in Brooklyn, NY and completed his Endocrinology, Diabetes, and Metabolism fellowship at UCLA and the VA Medical Center in Sepulveda, CA. He then relocated to Murfreesboro, TN where he served as Assistant Professor in the Department of Medicine at the Alvin C. York VA Medical Center and Meharry Medical College. He has settled in rural Shelbyville, TN where he and his wife have raised their three children. He was also affiliated with Vanderbilt University Medical Center as Clinical Assistant Professor in the Department of Medicine while in TN. He is Board-certified in both Internal Medicine and Endocrinology, Diabetes & Metabolism. His clinical interests are in General Medicine and Endocrinology. Dr. Ilarde believes in good communication with his patients as a means to deliver the best possible care and enjoys the time spent in clarifying his patients’ treatment plans with them. He is fluent in English and Tagalog. He is excited and proud to be part of the UCLA Health team.